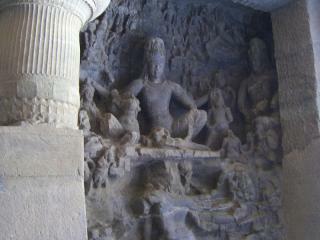 The Elephanta Caves are two groups of caves that contain Hindu and Buddhist rock art architecture. 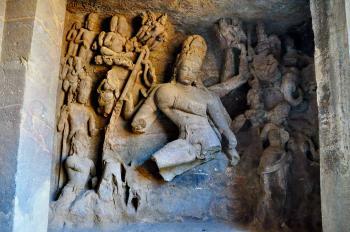 The reliefs and sculptures in the caves has been dated to between the 5th or 6th and 8th centuries. The Hindu caves are dedicated to the god Shiva. These were regular Hindu places of worship, and during the festival of Shiva still continue to be so. The caves are hewn from solid basalt rock. All caves were painted in the past, but only traces remain. 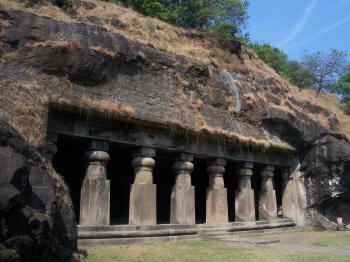 The caves are located on the Elephanta Island in the Mumbai harbour. The Portuguese named the island "Elephanta Island" in honour of a huge rock-cut black stone statue of an elephant that was then installed on a mound on the island. That elephant now sits in the Jijamata Udyaan zoo in Mumbai. I visited this WHS in November 2016. I had an early morning flight from Goa to Mumbai and so I opted to beat the rush hour morning traffic and head straight to the Gateway of India and the Taj Palace & Tower. I bought my tickets for the "luxury" ferry to Elephanta Island which is less crowded and in a slightly better state than the "normal" ferry. I also opted to pay the extra 10 rupees to stay on the upper deck which is even less crowded and great for taking photos of the Gateway of India. After around one hour in the Arabian Sea, I set foot on Elephanta Island and decided to walk along the jetty instead of waiting for the tourist train to depart. After a number of stalls, 5 rupees are collected as local tax and then you have to walk uphill for a while before getting to the Elephanta Caves entrance. There are 5 Hindu caves in total even though the main cave has the most important sculptures. Having visited Ellora, Ajanta and Badami Caves, I failed to appreciate any OUV in this WHS and apart from the 6 metre Trimurti of Elephanta (picture) showing the three faces of Shiva all the other sculptures are damaged and only worth viewing as a national heritage or pleasant sidetrip from Mumbai. However, I don't think I'll ever forget the Elephanta Caves as after my visit I found out that the 1000 and 500 rupee notes had been banned overnight and were no longer legal tender. Perfect timing I thought as I had just exchanged all my Euros to 1000 and 500 notes the day before which meant I had to waste more than 2 hours at the bank to exchange all my money before I could continue my trip towards Aurangabad. After lunchtime from the Gateway of India, a symbolic entrance to subcontinent during the British Empire in Mumbai, I took a boat ride to see the Elephanta Caves on the island of the same name just outside the metropolis. The trip took exactly one hour to reach the island passed many navy bases, cargo ports, petroleum jetties and a nuclear power plant, if not because of UNESCO protection, I believe Elephanta Island will be a part of Mumbai electrical grid production. On the island I had been approached by the typical guide scam who always claimed that you need a proper guide to enter the caves, just ignored them. I rode the mini train from port to the island. From the train parking, I had to pay a small landing fee, and then I walked thru many souvenir shops and restaurants, these shops made the island like a market place and seemed to me that many tourists loved shopping even before seeing the caves. Since the caves were located on the hill in the middle of island, the way to the caves required some hiking. Again along the hiking route in the forest were full with souvenir shops and warning signs for monkey attack. On the hill there was another ticket counter but this time for the caves. 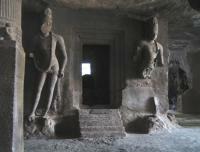 I immediately followed people to see the cave no.1 which I believed the sole highlight of Elephanta. The cave was quite impressive than my original though. The cave was adorned with many Shiva depictions. The beautiful Shiva Nataraja next to the main entrance was really impressive even in partial ruined state. But the centerpiece of the cave was the big statue of three heads Shiva. I was really confused as many travel websites called the statue as Trimurti, from my understanding Trimurti means Brahma, Shiva, and Vishnu together, and the depiction I saw was no way Brahma and Vishnu. Strangely I got the answer couples of day later while I was in Old Goa; I met an ASI archaeologist, so I asked him the question and he explained to me that my understanding was correct and the depiction should be called Maheshmurti, three heads Shiva, not Trimurti. There were many other interesting and beautiful depictions in the caves, and I found the cave to be a great place to revive and test my Hinduism knowledge which I learned from my Indian friend when I was in high school especially the story of Shiva. I decided not to see other caves as I heard there was nothing much to see and I wanted to go back to Mumbai before sunset, so I walked back to the pier and ended my Elephanta Caves tour within 1.5 hour. 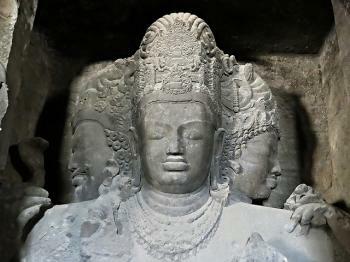 In my opinion, Elephanta Caves should not be compared with Ellora or Ajanta, since the size of those two sites will definitely make Elephanta to be an underdog, but the Shiva depictions on Elephanta are more refined and graceful than Ellora For me Elephanta Caves is something like a small museum that possessed one great masterpiece that must see in India. Simply gorgeous! Words are not enough to describe the work of the sculptors in the 7th century. The Trimurthi statue,in my opinion,is the best. Satyam, Sivam, Sundaram!! The Elephanta caves are a wonderful link to our past. We caught a boat from Belapur to the caves. A toy train is available to take us close to the caves. Unfortunately most of the tall statues were destroyed and only a few are still standing. However the famous caves are still worth a visit. There were lots of monkeys too. First things first; the enormous carvings in the first cave really are impressive, and rank alongside the very best at Ellora/ Ajanta. However I have to say this was perhaps my biggest disappointment on my little South Asian jaunt. Aside from the impressive first cave there is really nothing else of note. The other five or six caves at the site are all devoid of decoration and some look little more than natural caves, apparently the soft stone made it difficult to carve lasting art works. Cave 1 really is impressive and even on its own justifies the inscription on the World heritage list. I was hugely impressed by the Trimurti, a massive depiction of Shiva with three heads. The size of the other sculptures really was remarkable as well. But that was about it. I walked off in anticipation of seeing more sculptures but saw nothing but empty caves. After about 15 minutes I turned back and spent some more time in the main cave, then headed home. This was the only site where I had trouble getting the free entry that was granted by it being Indian World Heritage week, but the attendants did eventually relent for me, but carried on charging everyone else despite the large signs saying otherwise. The caves are on an island in Mumbai harbour and it was a nice trip out there, it take about an hour each way and boats leave from the Gateway of India. This meant I got to pay homage to my earliest travel hero, Michael Palin, by arriving at the gate from the sea. It made a nice half day trip away from the hustle of Mumbai, and I would say it was worthwhile; however I was disappointed by the limited nature of the site. If you have overloaded your senses and need to get out of Mumbai for a day, a slow cruise to the Elephanta Island and the Elephanta Caves is exactly what you need. Some 9 km north of the Gate of India, in the Sea of Oman, the Elephanta Island and its caves are the premier tourist attraction of Mumbai. The 50-minute cruise takes you from one world to another. Suddenly the air is fresh and the sound of the bustling city is far away. Little is known about the origin of the Elephanta Caves but they are thought to have been created between 450 and 750 AD when the island was known as Gharapuri (Place of Caves). The Portuguese renamed the island Elephanta because of a large stone elephant near the shore. The statue collapsed in 1814 and the British then moved it to the mainland. The Elephanta Caves consist of one main cave and several smaller. In the main there is a number of large sculpted panels, all relating to Shiva. Some of the rock surfaces are finely finished whereas some are unfinished bare rock. In the main cave there is an enormous central bust of Shiva with its eyes closed in eternal contemplation. Elephanta is certainly worth a visit but foremost its a nice escape from Mumbai for half a day. Compared to the Ajanta and Ellora caves, that I later visited they tend to fall down slightly in rank. I wish all could enjoy. Thomas Cook Round the World tour 1872-1873: c Feb 1873 "We arrived at Bombay nearly a week before our departure for Egypt, and had ample time for the inspection of this rapidly increasing city. A trip to the Island of Elephanta, where there are strange rock hewn temples, occupied one of the days allotted to Bombay. Built in the 6th century: The age of the caves is debated. The Archaeological Survey of India states "There are seven cave excavations in the Elephanta group and these are datable from circa 6th - 7th centuries A.D." . Wiki places them at "between the 5th and 8th centuries".